The following list represents one fan's rankings of the five best Western songs. I'm excluding pop songs that appeared in Westerns (Raindrops Keep Fallin' on My Head as well as Western musicals (Annie Oakley, Gene Autry). I'm sure there will be some dissenting opinions, especially since perhaps the most famous of Western songs comes in at No. 4. But hey, a little lively disagreement is a good thing on a classic movie blog! 1. 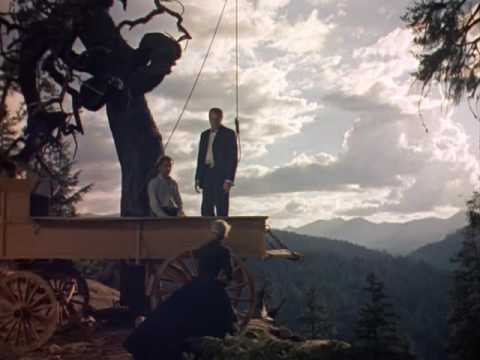 The Hanging Tree (Max David & Jerry Livington) - Easily my favorite of the Western "story songs" (it also summarizes the film's theme). After I saw the Gary Cooper movie, the song stuck in my head to the point that I had to special-order the Marty Robbins recording on a vinyl 45 (yes, that was before MP3 downloads). The song was a minor hit for Robbins on the charts, but it has aged beautifully. Glenn Ford and Van Heflin. ﻿﻿ 2. 3:10 to Yuma (George Duning and Ned Washington) - I'll differ from the majority who site Gunfight at the OK Corral as the best of the Frankie Laine-sung Western themes. Yuma is a moody, almost sad piece...a stark contrast to the usual uptempo Western song. Cooper readies for the showdown. 4. The Ballad of High Noon (aka Do Not Foresake Me, Oh My Darlin') - Probably the most influential song on this list, it won an Oscar and turned into a big hit for the already-popular Tex Ritter. In fact, Ritter sang it on the first Academy Awards telecast in 1953. It ranked No. 25 on AFI's 100 Years...100 Songs. 5. Friendly Persuasion (Dimitri Tiomkin & Paul Francis Webster) - An untraditional song for an untraditional Western (some may argue it's not a Western, but the Civil War subplot is central to the story). Pat Boone recorded the song in 1956 for one of his biggest hits. Honorable mentions: How the West Was Won, Blazing Saddles, and True Grit. Sorry I can't provide some lively disagreement, but that's a good list. 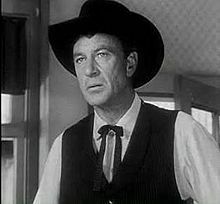 The "3:10 to Yuma" song was used instrumentally in a Fred MacMurray western called "Good Day for a Hanging". Every time the theme came up in that movie, I start singing the song from "Yuma". I'd like to mention a couple of western themes that benefited from being sung by ladies, Peggy Lee telling us about "Johnny Guitar" and Julie London dreaming about "Saddle the Wind". I wonder if you considered a couple of my favourites: Tennessee Ernie Ford singing "River of No Return" and the great whistling theme of "The Proud Ones". Like they say in the Disney cartoon - "A Cowboy Needs a Horse" - and a rope and a song. Oooh, love this kind of post...I don't disagree, since this is your numbering of personal favorites. I like all of them. I always loved Frankie Laine -- didn't he do "Ghost Riders in the Sky"? I don't know if it's from a movie, but I could picture the riders like the 4 Horsemen of the Apocalypse! I think my very favorite of all time, as you mentioned about Friendly Persuasion, is not from a traditional western -- "The Green Leaves of Summer" from The Alamo. When those men are sitting around fires in the dark, thinking, knowing what's coming the next day -- I can feel that haunting song up and down my spine. Rick, I especially like "The Hanging Tree" because it sums up the whole film perfectly. "Gunfight at OK Corral" would have to be my second favorite because it makes it clear that Boot Hill will have more residents courtesy of the title event. Clever post! Okay, now I can't get the "High Noon" song out of my head! Great "theme" post (pun intended). Great additions! I forgot about JOHNNY GUITAR, RIVER OF NO RETURN, and the song from THE ALAMO. My wife noted I didn't even give an honorable mention to "The Ballad of Chuck-a-Luck" from RANCHO NOTORIOUS. While I know some people hate that song, it's critical to the structure of the film. Chuck-a-luck is a game like routlette, played with a spinning wheel. The film is thematically circular--whole articles have written about this...and I omitted it altogether! The Western isn't my favorite genre, so I can't add anything to the ones in the list or the other songs suggested. But I do agree with placing "The Hanging Tree" in the number one spot; it's the one I remember most clearly! Wonderful start to the month of Best 5 Lists! The lively western song from, Two Mules for Sister Sara. It maybe a little weird.. but, I love it. The beautiful song, "They Call the Wind Maria" From the western, Paint Your Wagon. The fun song, My Rifle My Pony And Me, from Rio Bravo. My favorite is "Gunfight at the Corral" followed by the incredibly infectious "The War Wagon." Two Dmitri Tiomkin compositions. Always liked the story of how a Russian wrote such great Western songs. Tiomkin replied, "Well, a steppe is a steppe..."